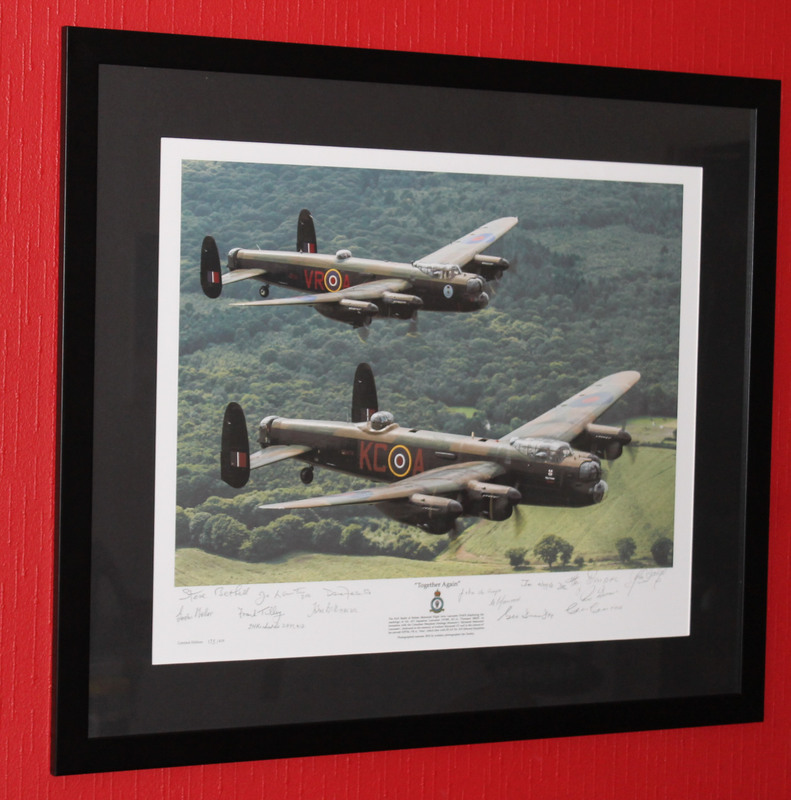 This amazing print was signed by 14 Second World War Bomber Command veterans representing 2 heavy bomber crews. The RAF Battle of Britain Memorial Flight Avro Lancaster PA474, displaying the markings of No. 617 Squadron Lancaster DV385, KC-A,’Thumper MkIII’, in formation with the Canadian Warplane Heritage Museum’s ‘Mynarski Memorial Lancaster’, dedicated to the memory of Andrew Mynarski VC and painted in the colours of his aircraft KB726,VR-A, ‘Vera’, which flew with RCAF No. 419 (Moose) Squadron. Photographed by aviation photographer Jim Dooley. Number 173 of 419 titled, numbered, and signed individual prints. Signed by 14 Second World War Bomber Command veterans representing 2 heavy bomber crews. Pilot: Jo Lancaster DFC; Pilot: George Dunn DFC; Navigator: Jim Wright DFC; Navigator: Gordon Mellor; Bomb Aimer: John Bell MBE, DFC; Bomb Aimer: Charles Clarke OBE; Flight Engineer: Frank Tilley; Flight Engineer: Ron Brown; Wireless Operator: John de Hoop; Wireless Operator: John Richards DFM MID; Air Gunner: Harry Irons DFC Air Gunner: Dave Fellowes; Air Gunner: Steve Bethell Air Gunner: Gerry Norwood.